Nestus Freeman … of Ohio? 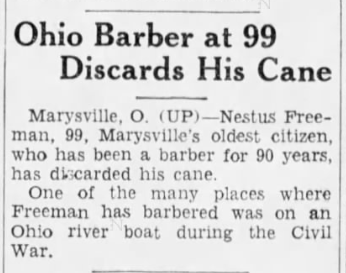 Eighty years ago today, a newspaper in a small central-Ohio town published a tribute to one of its citizens on the occasion of his 100th birthday. “Nestus Freeman, colored citizen of this city — ” Nestus Freeman? “Mr. Freeman was born in Wilson, North Carolina, on March 16, 1839.” Born in Wilson? Who was this Nestus Freeman? The article mentions that Freeman ran away from slavery as a child (or, had never been a slave); began barbering at age 7; fought for the Union under an assumed name during the Civil War; worked on a riverboat between Pittsburgh and New Orleans; lived in Urbana and Richwood, Ohio, before settling in Marysville in 1880; had lost his wife in 1909 due to a house fire; and had at least two children, son Shirley Freeman of Marysville and daughter Gertrude Putnam of Cleveland. Marysville Journal-Tribune, 17 March 1939. What information can be gleaned from readily available records? On 13 March 1873 Nestus L. Freemond married Amanda E. Diltz in Champaign County, Ohio. A tiny notation in the corner of their license identifies them as members of Champaign’s tiny African-American community. In the 1900 census of Marysville, Union County, Ohio: Nathan [sic] Freemond, 51, barber, born Pennsylvania; wife Amanda A., 45, hairdresser; and children Lydia, 22, hairdresser, Shirley, 19, barber, Elsia, 16, and Gertrude, 10. Marysville Journal-Tribune, 20 May 1909. In the 1910 census of Marysville, Union County, Ohio: at 301 North Maple, N. Freeman, 70, barber, born in Ohio, and children Lydia, 32, Shirley, 29, barber, and Elsa, 25, barber. In the 1930 census of Marysville, Union County, Ohio: at 307 North Maple, owned and valued at $3000, widowed barber Nestus Freeman, 86, born in Pennsylvania; daughter Lydia M., 54; and son Shirley, 49, barber. 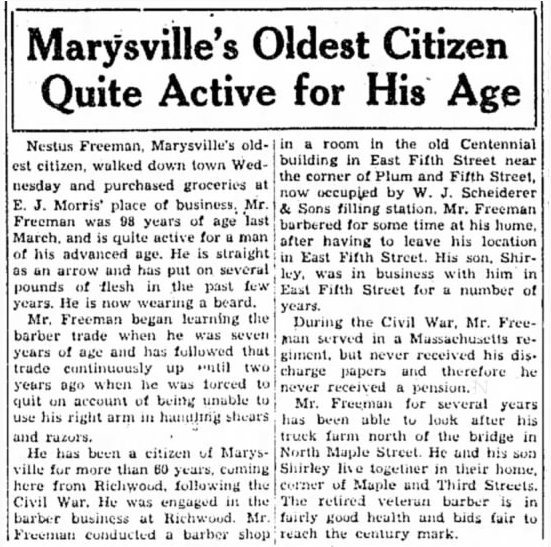 As Nestus Freeman entered his upper 90s, newspapers delighted in reporting on his picturesque life. Marysville Journal-Tribune, 14 July 1937. Marysville Tribune, 31 March 1938. Pittsburgh Courier, 25 March 1939. In the 1940 census of Cleveland, Cuyahoga County, Ohio: at 10103 Yale Avenue, John Putnam, 63, shade cutter at department store; wife Gertrude F., 42; father James A. Putnam, 84; and father-in-law Nestus Freeman, 96, born in North Carolina. 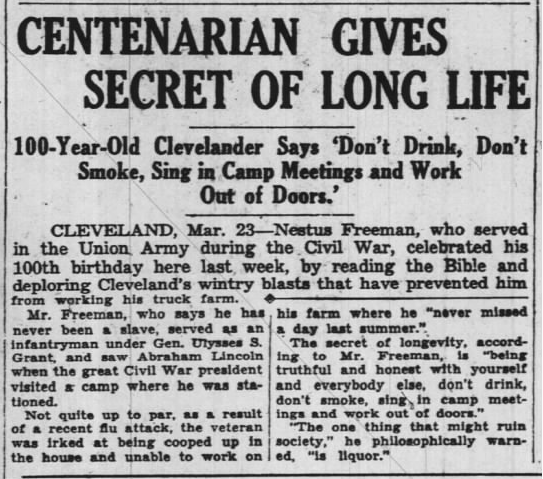 At last, days before his 102nd birthday, Nestus Freeman passed away at his daughter’s home in Cleveland. Union County Journal (Marysville, Oh. ), 3 March 1941. Marion (Oh.) Star, 5 March 1941. Allen Chapel A.M.E. Church, Marysville, Ohio, circa 1900. Nestus and Amanda Freeman’s funerals were held here, and they may well be pictured. Photo courtesy of Allen Chapel’s Facebook page. Charles [Shirley] Freeman died 7 October 1948 in Orwell, Ashtabula County, Ohio. 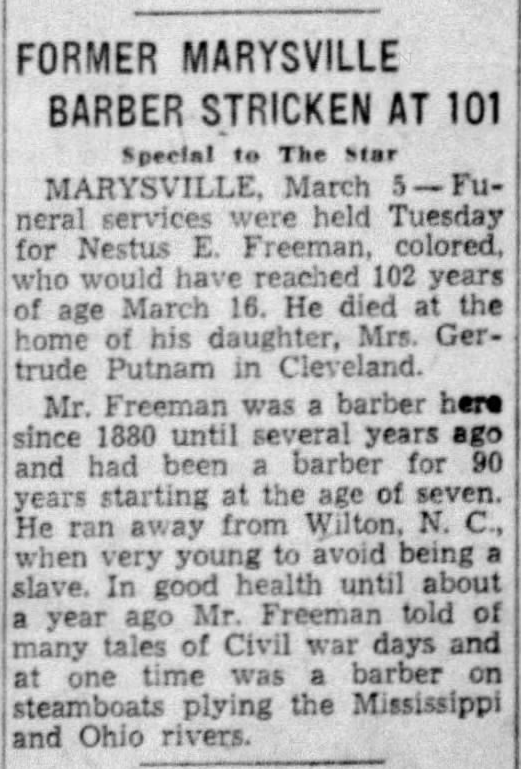 Per his death certificate, he was born 13 June 1886 in Marysville, Ohio, to Nestus Freeman of Wilson, N.C., and Amanda Diltz; was married; and had worked as a barber. Gertrude Putnam died 5 February 1953 at Perry township, Stark County, Ohio. 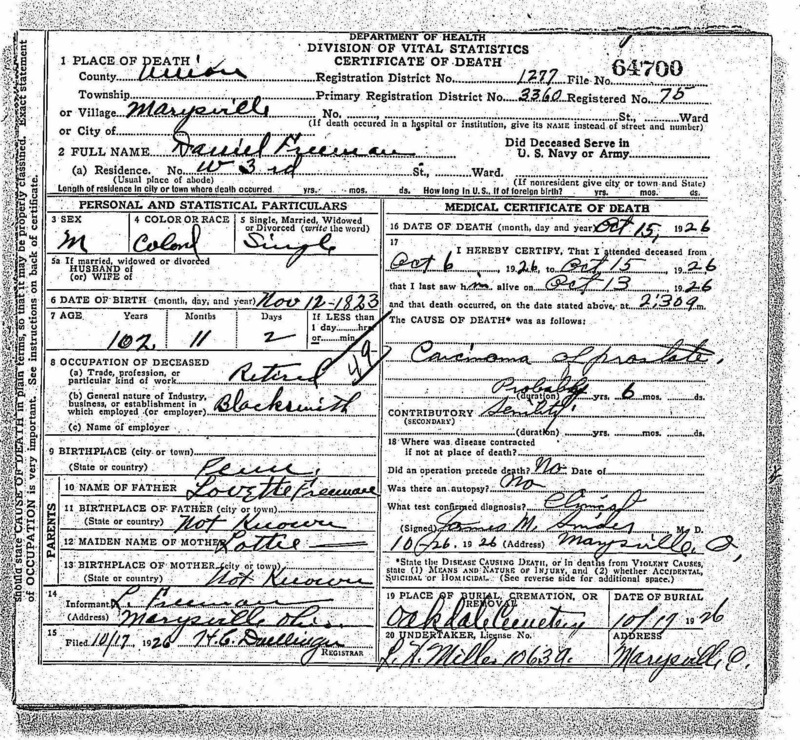 Per her death certificate, she was born 14 March 1885 in Marysville to Nestus Freeman and Amanda Diltz; resided in Orwell, Ashtabula County; and was married. She was buried in Oaklawn cemetery, Marysville. So, was there a connection between Nestus Freeman of Ohio and Oliver Nestus Freeman of Wilson? There is the obvious hint in their names. Was O.N. named after an uncle who left North Carolina long before he was born? Though Nestus reported his birthplace as Pennsylvania to Union County census takers, it was recorded as North Carolina by a Cuyahoga County enumerator; as Wilson and Wilton, North Carolina, by two reporters; and as Wilson on a son’s death certificate. Another hint lies in children’s names. The graves of the Freeman family are marked by a single large red granite headstone in Marysville’s Oaklawn cemetery. 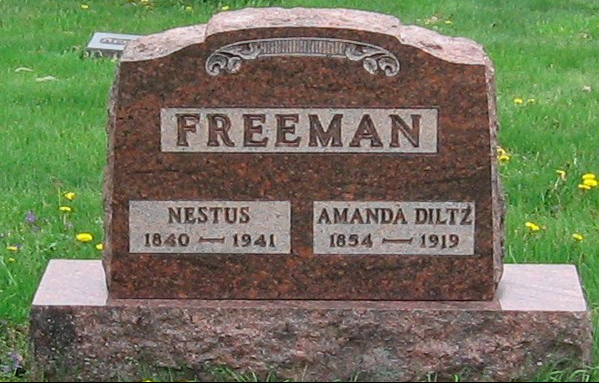 Nestus and Amanda’s dates should read 1839-1941 and 1854-1909. The back of the stone lists the Freeman children (except Gertrude in Cleveland.) 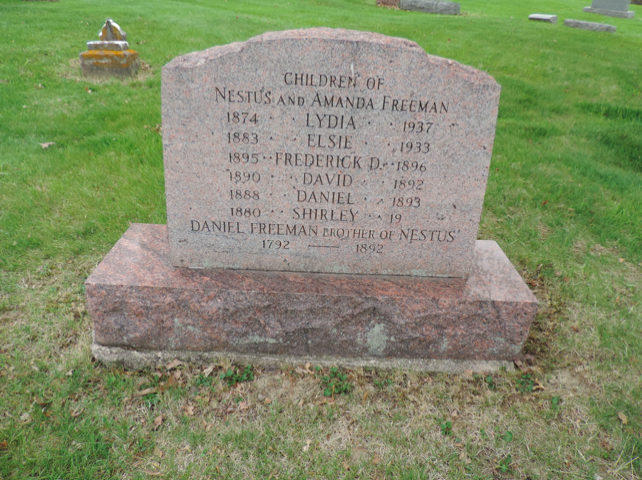 Notably, two of Nestus’ children, Lydia and Daniel, shared names with two of O.N. Freeman’s siblings, Lydia Ann Freeman Norwood Ricks and Daniel Edward Freeman. And — surprise! — there’s a brother of Nestus, also named Daniel. Photos courtesy of Findagrave.com. The dates given for Daniel Freeman’s lifespan seem unlikely. A 1792 birth year would have made him almost 50 years older than his brother Nestus. I did some searching for Daniel and — voilà! Marysville Journal-Tribune, 15 October 1926. Death certificate of Daniel Freeman, which lists his parents as Lovette Freeman and Lottie, maiden name was unknown. Julius Franklin Freeman was born about 1844 in Johnston County, North Carolina. He appears in the 1870 census of Wilson as an adult, already working as a carpenter. Neither his marriage licenses nor his death certificate list his parents. Based on the above, however, it seems clear that Julius’ father was named Lovett Freeman and that he had at least two brothers, Daniel and Nestus. The 1840 census of Johnston County lists a Lovet Freeman. The census taker apparently forgot to mark the columns beside his name to designate the age and color of members of Lovet’s household, but he was most likely a free person of color. If this were Daniel and Nestus and Julius’ father, when did he and his family leave North Carolina? Did they first migrate to Harrisburg, Pennsylvania? Did Julius remain behind, or did he return, perhaps after the Civil War? Were there other children? The 1860 census of Cleveland, Cuyahoga County, Ohio, shows North Carolina-born blacksmith Mathew Freeman, 45; wife Fairly, 30; and children Daniel, 14, Henry B., 10, Lovet B., 9, Liza A., 7, Joseph G., 3, Hanna B., 3, and Bob, 5 months. Again, the names Daniel and Lovett. In addition, Julius had sons Henry and Joseph as well. Was Mathew Freeman perhaps a brother of Lovett Freeman? Snaps, no. 43: Mattie Taylor. The genealogies of African-American families are often complex in ways that may surprise us. The fact that many African-Americans had white male ancestors in the 18th and 19th centuries does not raise eyebrows. That many also descend from white female ancestors who lived in that time period is less well-known. The descendants of Elizabeth Taylor are one such family. Taylor was born about 1815, probably in southern Nash County, North Carolina. She had at least five children, some of whom were white and others mixed-race, including daughter Abi Taylor. Mattie Taylor (ca. 1877-1971), daughter of Abi Taylor. In the 1850 census of Nash County, North Carolina: Elizabeth Taylor, 35, and children Mary Ann, 14, Hilliard, 12, Abi, 6, Bryant, 4, and Harry, 1 month. Abi and Harry were described as mulatto; the others white. In the 1860 census, Kirbys district, Wilson County: Elizabeth Taylor, 42, farm laborer, and children and grandchildren Abia, 18, Bryant, 14, Jackson, 12, Kinchen, 10, and McDaniel, 7. All were described as white except Abia, Jackson and Kinchen, who were mulatto. In the 1880 census of Stantonsburg township, Wilson County: Abi Taylor, 35, and children James, 20, Levi, 14, Mike, 12, Sallie, 7, Martha, 3, and Richard, 1. John Sharpe married Sallie Taylor on 20 April 1889 in Wilson County. Mike Taylor, 20, of Gardners township, Wilson County, married Estella Pender, 18, of Toisnot township, Wilson County, on 18 January 1890 at Amos Pender‘s. In the 1900 census, Gardners township, Wilson County: John Sharpe, 32; wife Sallie, 26, and children Lossie, 7, Suckie, 5, John, 2, and Jennie, 5 months, plus Sam Sharpe, 20. In the 1910 census of Wilson township, Wilson County: on the Elm City Road, John Sharp, 43, wife Sallie, 37, and children Lossie, 16, Mathosie, 14, Johnnie Jr., 12, Geneva, 9, and George, 7. In the 1910 census of Saratoga township, Wilson County: on Rocky Mount Road, Mattie Taylor, 36, and children Gray, 14, Benjamin F., 8, Lee R., 7, Mary, 6, Annie, 2, and Hilliard, 6 months. In the 1920 census of Saratoga township, Wilson County: Mattie Taylor, 30, and children Levy, 14, Mary, 13, Annie, 12, Hilliard, 10, Archie, 7, Joseph, 5, and Marvin, 3, plus Abi Taylor, 75. In the 1920 census of Old Fields township, Wilson County: on New Wilson and Raleigh Road, farmer John Sharp, 53; wife Sallie, 48; and children Sardie, 24, Johnie, 22, Eva, 19, and George, 16, and daughter-in-law Mollie, 26. In the 1920 census of Wilson township, Wilson County: Mike Taylor, 46, wife Estella, 35, and son James, 20. On 12 December 1928, Mike Taylor, 57, married Elizabeth Evans, 45, in Wilson. On 5 December 1929, Lee Taylor, 26, of Saratoga township, son of Mattie Taylor, married Sallie Barnes, 22, daughter of Cornelius and Maggie Barnes, in Wilson. In the 1930 census of Saratoga township, Wilson County: three households in a row on an “improved dirt road,” Emmit Taylor, 30, and wife Clauddie 27; Arthur Taylor, 21; Hillard Taylor, 53, wife Annie, 48, and children Walter, 24, and Moses, 14; Lee Taylor, 26, wife Sally, 23, widowed mother Mattie, 56, her children Archie, 16, Joe, 15, and Marvin, 12; and widowed grandmother Abbie Taylor, 91. In the 1930 census of Springhill township, Wilson County: John Taylor, 65, wife Sallie, 59, and boarder Monroe Whitley, 45. In the 1930 census of Wilson township, Wilson County: Mike Taylor, 60, wife Elizabeth, 41, and son Carlie, 12. Mike Taylor died 6 March 1932 in Wilson township, Wilson County. Per his death certificate, he was born 15 May 1870 to Archie Taylor and Abie Taylor and was married to Elizabeth Taylor. Informant was Mazie Taylor. Hilliard Taylor died 24 August 1944 in Saratoga township, Wilson County. Per his death certificate, he was 65 years old; was born in Wilson County to Wash Powell and Avie Taylor, both of Wilson County; and was married to Gussie Taylor. Informant was Walter Taylor. 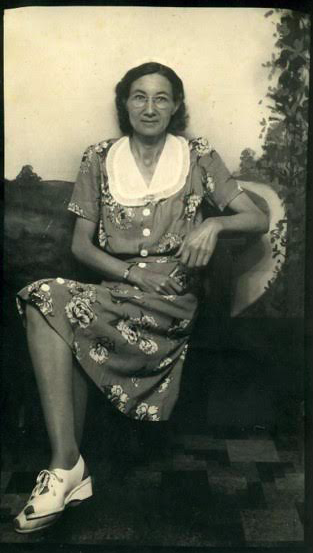 Sallie Sharpe died 4 March 1955 at her residence at 314 South Goldsboro Street, Wilson. Per her death certificate, she was born 1 May 1874 in Wilson County to Cage Archey and Abby Taylor and was buried at New Vester cemetery, Wilson County. Informant was Mrs. Lossie Mitchell, Lucama, N.C.
Mattie Taylor died 11 October 1971 at 129 Narroway Street, Wilson. Per her death certificate, she was a widow; was born 15 August 1876 to an unknown father and Abbie Taylor, and was buried in Rest Haven cemetery. Informant was Mrs. Mary T. Bynum. Photograph courtesy of Ancestry.com user ________. Mary Jane Stancil and family. As shown here and here and here, the interrelated Ayers, Hawley, Rose and Taylor families shifted back and forth across the color line for decades. Despite highly publicized legal challenges to their status, most were accepted as white by about 1920. Mary Jane Taylor Stancil (1867-1921), upper left. 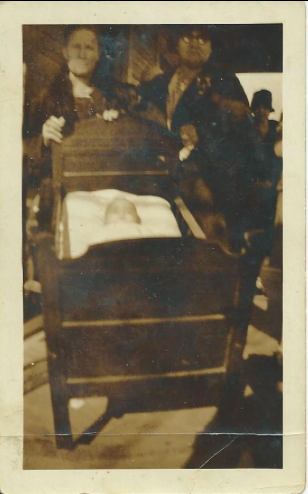 The infant is her son Oscar Stancil, who died in 1904. This may be a death portrait, a type of memento mori. The women at right at are unknown. In the 1880 census of Oldfields township, Wilson County: Sallie Taylor, about 45; and her children William, 19, Jacob, 17, Jane, 14, Robert L., 12, Thomas, 10, and Luretta, 8, all mulatto. On 12 September 1899, J.H. Stancil, 23, white, of Wilson County, son of Andrew and Nancy Stancil, married Mary Jane Hawley, 28, white, of Johnston County, daughter of Sally Ann Hawley, in Johnston County. In the 1900 census of Springhill township, Wilson County: farmer James H. Stancill, 23, and wife Mary J., 20, both white. In the 1920 census of Crossroads township, Wilson County: farmer James H. Stancil, 42, wife Mary J., 50, and daughter Viola, 17, all white. Mary Jane Stancil died 5 July 1921 in Oldfields township, Wilson County. Per her death certificate, she was born 14 October 1867 in Wilson County to John Clark of Johnston County and an unknown mother; was married to John [sic] H. Stancil; and was white. 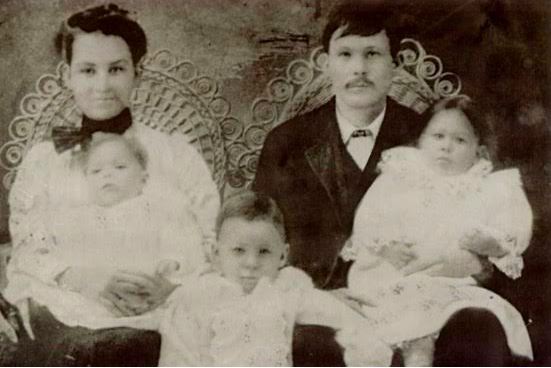 Josephus and Minnie Taylor Johnson and their oldest children Arthur, Fannie and Carl. Josephus and Minnie Johnson took their fight to have their children admitted to white Wilson County schools to the North Carolina Supreme Court, and lost. Minnie T. Johnson was Mary Jane Stancil’s niece. Viola Stancil Lucas was the daughter of James H. and Mary Jane Taylor Stancil. Many thanks to Linda Lucas Martin for sharing these family photographs. James B. Woodard registered the receipt he issued to free woman of color Penny Lassiter for the $150 she paid to purchase her husband London Woodard in 1855. Though not legally manumitted, London lived essentially as a free man for the next ten years until Emancipation. Deed book 1, page 155, Register of Deeds Office, Wilson. London Woodard, Penny Lassiter Woodard and the London Church. On 14 February 1970, the Wilson Daily Times published a full-page article detailing the life of London Woodard, founder of London’s Primitive Baptist Church. London Woodard was born enslaved in 1792. He was recorded in the estates of Asa Woodard in 1816 and Julan Woodard in 1826 (in which he was recognized as a distiller of fine fruit brandies.) In 1827, James B. Woodard bought London at auction for $500. The same year, London married Venus, a woman enslaved by Woodard. In 1828, London was baptized and appears as a member in the minutes of Tosneot Baptist Church. Venus was baptized in 1838 and died in 1845. Transfer of title to “a negroe man by the name of Lonon” from Nathan Woodard to James B. Woodard, 1928. J.B. Woodard’s second wife in 1837, and he hired Penelope Lassiter, a free woman of color, as a housekeeper and surrogate mother to his children. Lassiter, born 1814, was the daughter of Hardy Lassiter, who owned a small farm south of Wilson. She met London, who was working as overseer, at Woodard’s. 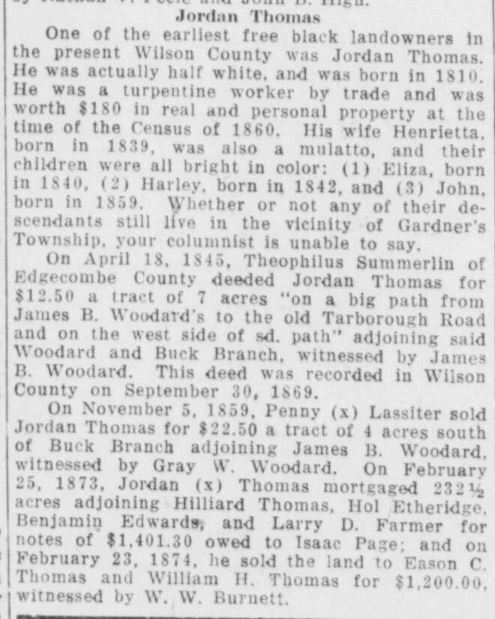 In 1852, Penny Lassiter bought 106 acres for $242 about five miles east of Wilson on the Tarboro Road. In 1854, Penny Lassiter purchased her husband London, then about 62 or 63, from J.B. Woodard for $150. In 1858 Lassiter bought another 53 acres near her first tract and purchased 21 acres in 1859. The same year, she sold a small parcel to Jordan Thomas, a free man of color [who was married to her step-daughter Rose Woodard.] 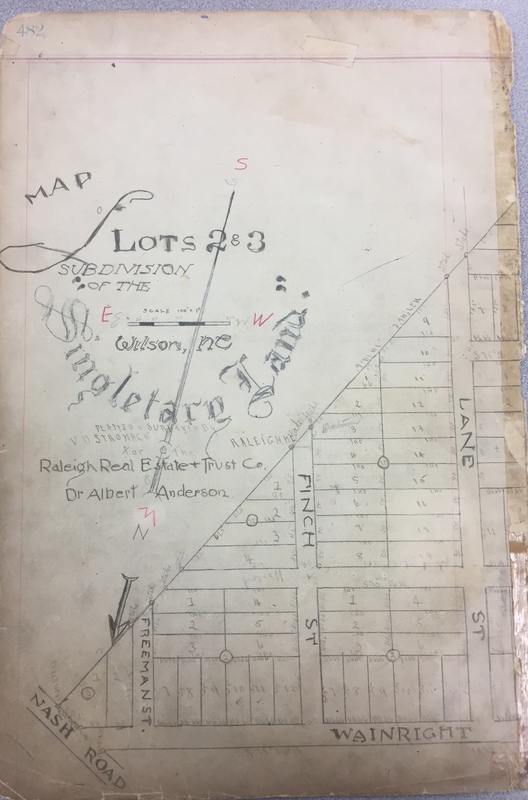 In 1866, the years after he was emancipated, London Woodard bought, subject to mortgage, a 200-acre parcel. In 1866, London Woodard was granted authority to preach “only among his acquaintances,” i.e. African-Americans. A member of Tosneot Baptist donated an acre of land to build a black church, regarded as the first in Wilson County. London Woodard was licensed to preach in 1870. London Woodard preached his last sermon on 13 November 1870. The next day, he suffered a stroke and fell into an open fireplace. Despite severe burns, he was able to dictate a will before his death. By the terms of his will, London Woodard provided for his wife Penelope; sons William, Hardy, Haywood, Howell, Elvin, Amos and London; and daughters Treasy, Rose, Pharibee, Sarah, Harriet and Penninah. (Deceased son John’s daughter was apparently inadvertently omitted.) “A few facts” about Woodard’s children follows. Receipts for payments for taxes and accounts for Penny Lassiter and London Woodard. This building was moved around the corner to London Church Road. It has long been abandoned and collapsed in 2017 after suffering serious storm damage the year before. Please come if you can, no. 1. Goldsboro’s not Wilson, but it’s right down the road, and many of Wilson’s African-American families have roots in antebellum Wayne County. 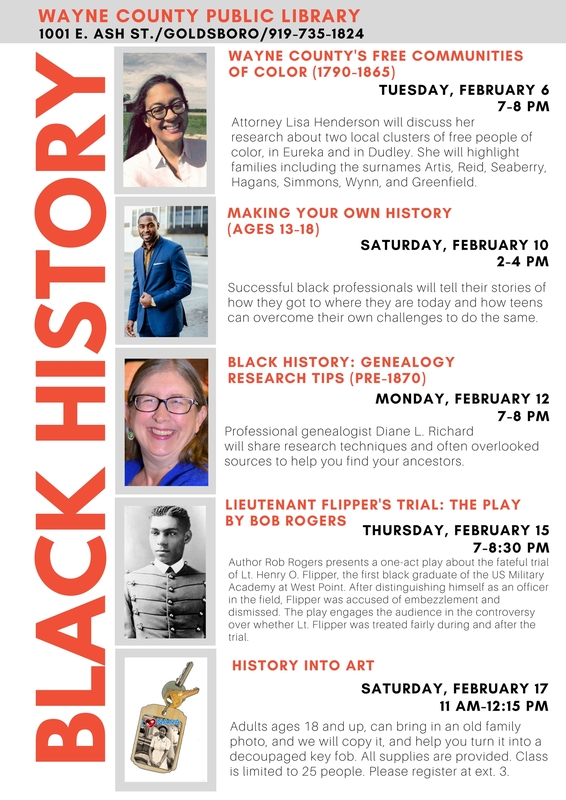 On 6 February 2018, I’ll be giving a talk about Wayne County’s free communities of color as part of the Wayne County Public Library’s Black History Month observation. I welcome your support! Wilson Advance, 12 November 1891. In the 1860 census of Edgecombe County: Richd. Hagans, 33, wife Alley, 31, and children Lawrence, 10, Laura, 8, Margaret, 6, Richard, 5, Neely, 3, and Charles Hagans, 3 months. Noah Lynch, Civil War veteran. In the 1850 census of the north side of the Neuse district, Wayne County, North Carolina: C.M. Richardson, 32, brickmason; wife Sarah, 24; and their children Jacob, 7, Joseph and Benjamin, 3, and Cisara, 1; plus, Julia Walton, 21, apprentices Green Bryant, 20, and Noah Linch, 20, and brickmason Thomas Piloot, 23. Noah Lynch married Piety Rose on 2 March 1853 in Edgecombe County. In the 1860 census of Town of Wilson, Wilson County: plasterer Noah Lynch, 30; wife Piety, 33, washerwoman; domestic Julia Higgins, 20; John James, 10; and Martha Taylor, 7; all mulatto. Noah reported owning $700 in real property. Noah and Piety Lynch apparently divorced or otherwise separated in the early 1860s. Noah Lynch, 34, colored, waiter, married, born in North Carolina, appears in a consolidated list of men who registered for the Union draft in June 1863 in New York City. Also in the list, Shered Lynch, 32, seaman, married, born in North Carolina. (Sherod Lynch married Harriet Moore at Gatlin Lynch’s in Wayne County on 12 July 1855.) Both resided on East Houston Street. On 4 May 1868, Noah Lynch, 29, black, son of Lary Lynch and Nancy Wilkins, married Mary Sweeny, 25, white, daughter of Patrick Sweeny and Bridget Bilon, in Manhattan. In the 1870 census of New York, New York County, New York: mason Noah Lynch, 40, and wife Mary, 30. Noah was a native of North Carolina; Mary, of Ireland. Both were described as white. In a duplicate entry in the 1870 census of New York City: on Houston Street, Noah Lynch, 42, machinist, born in North Carolina; wife Mary, 25, born in Ireland; and John Lynch, 30, waiter, also born in Ireland. All were described as white. On 8 January 1875, Noah Lynch, 40, son of Larry Lynch and Nancy Wilkins, married Anne Carey, 30, daughter of Luke Carey and Catharine Sweeney, in Manhattan. In the 1880 census of New York, New York County, New York: plasterer Noah Lynch, 50, and wife Annie, 34, both described as white. In the New York, New York, city directory of 1883: Noah Lynch, mason, 153 Second. In the 1905 New York state census: at 153-2nd Street, Noah Linch, 75, painter, white. In the 1910 census of Manhattan, New York County, New York; at 14 Avenue A, widower Noah W. Lynch, 80, and adopted daughter Matilda M. Roth, 37, a stage actress. Noah was described as white and born in North Carolina to German parents. Matilda was born in New York to German parents. Noah W. Lynch died 23 November 1913 in Manhattan. 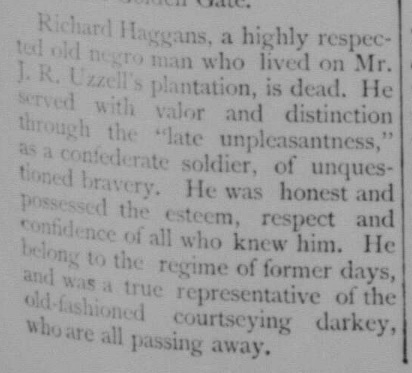 Per his death certificate, he was 84 years old; born in North Carolina to Larry and Nancy Lynch; was a pensioned mason; and was olive brown (colored). He was buried in Calvary Cemetery. On 1 December 1913, Matilda Roth of 14 Avenue A testified in Surrogates’ Court to prove Noah Lynch’s will. She averred that she had known Lynch about 33 years, that she had witnessed him sign his will on 23 November 1913 [the day he died] at his residence at 14 Avenue A and that Johanna Kuhnel and Valentine A. Schulz were also present. Johanna Kuhnel testified similarly, noting that she had known Lynch for about 25 years. I, Noah Lynch of the City, County and State of New York, being of sound and disposing mind and memory, and considering the uncertainty of this life, do make, publish and declare this to be my last Will and Testament as follows, hereby revoking all other and former Wills by me at any time made. 1st First, after my lawful debts are paid, I give to my beloved half-sister, Mary Tillman (widow) residing at Bergen Street near 3rd Avenue in the Borough of Brooklyn, New York City the sum of Eight Hundred Dollars, the same to be held in trust in the name of my executor, and the same to be deposited in the Bank, during her life. I direct my Executor to pay her from time to time the amount necessary to defray the expenses for her maintenance, that he may see fit after her death, my executor shall see that she has a proper burial and whatever moneys he may have on hand or the balance of the above named sum shall be used in erecting a monument or Tombstone, over her last resting place. 2nd. I give to Mary Sands of 2472 Marion Avenue, Borough of Bronx, New York City, the sums of Five Hundred Dollars, that is to say if there is so much on hand to pay her the same, if there is not so much on hand, she shall receive Two Hundred Dollars. 3rd. I give my (gold watch) to my friend John Sands of 2472 Marion Avenue, Borough of the Bronx, New York City. 4th. I give to Ellen Dwyer, for her good services rendered in my sickness and my last moments and for her kindness, the sum of Five hundred Dollars, that is to say if there is so much on hand to pay her the same, if there is not so much on hand, she shall receive Two Hundred Dollars. 5th. I give to my Executor Val. A. Schulz of 214 East 4th Street New York City, for the faithfull performance of his duty or extra compensation for the amount of Labor he will have in attending to matters of my estate he is to have Two hundred and Fifty Dollars, besides his legal allowance. 6th. I hereby direct my executor to give me a decent funeral and a Requiem High Mass at the Church of the Nativity, 2nd Avenue, bet 2nd and 3rd street, New York City. 7th. I hereby direct my executor to pay one hundred dollars to the Most Reverend Father Reilly, the Rector of the Church of the Nativity, at 2nd Avenue bet 2nd-3rd Street New York City, the same is to be used for reading Masses after my death. I hereby direct my Executor to use the balance of my estate if there be any balance to erect a suitable Monument over my last Resting place. 8th. I hereby direct that my Executor Valentine A. Schulz of 214 East 4th Street, shall serve as my Executor without filing any bonds as I have confidence in his honesty, faithful performance of his duty and I am sure he will carry out my last wishes. 9th. My entire estate consists of 1 Bank account on Bank Book number 658,003 on the Bowery Savings Bank, and another Bank book number 1,015 832 on the 4th Ave Bank at 200 4th Avenue, New York City, and other small articles of no value. 10th. I give to Matilda Roth of 14 Ave A, New York City, who I have raised and who has done so much for me, and for services rendered to me during my lifetime and during my sickness, I hereby give her eight hundred Dollars and I direct my Executor to pay her the same as soon as the law permits. I also give her a ring of plain type. 11th. I hereby direct my executor to pay any attention to those claiming relationship. I have no relatives living accepting my half sister Mary Tillman of Brooklyn, New York City. 12th. And I further direct my Executor not to pay any one who will cause him any trouble, that is to say of those named in this my last will and testament, by trouble I mean any one contesting this my last will and Testament. I hereby appoint Valentine A. Schulz, 214 East 4th Street, New York City, to be Executor of this my last Will and Testament. I have no record of Mary Tillman in North Carolina. However, in the 1894 Brooklyn, New York, city directory: Tillman, Mary, wid. Thos., h 263 Bergen. In the 1900 census of Brooklyn, Kings County, New York: at 263 Bergen, widowed North Carolina-born laundress Marie Tillman, 74, with boarder Alexander Moore, 27, and his wife Julia, 26, and three other families. In the 1910 census of Brooklyn: at 263 Bergen, Virginia-born Susan Brown, 34, laundress, and her Florida-born boarder Joseph Robertson, 28, a hotel waiter, and North Carolina-born Mary Tillman, 87, and her lodger Benjamin Simmons, 70, a carpenter. The Sun, 10 March 1914. New York Times, 10 March 1914.